Now, in Get Your Bake On, Brian shares over seventy-five recipes that leave no doubt as to why he was crowned champion on the show. 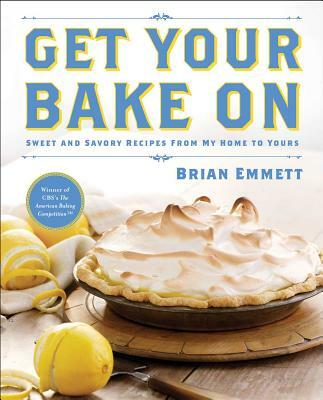 This cookbook encompasses a hearty mixture of The American Baking Competition favorites, brand-new concoctions, and Emmett family recipes passed down through generations. Staying true to the show’s theme, there are plenty of sweets: From miniature tarts to his famous Cakey Chocolate Chip Cookie, Brian’s baked goods are sure to satisfy even the most demanding of sweet tooths. But Get Your Bake On also features a strong savory element with classic, feel-good recipes such as Sunday Brunch Strada and Beef Chili with Buttermilk Cornbread. Brian Emmett, the ultimate “foodie” and home entertainer, has been baking, cooking, serving, and designing the most unique culinary experiences for over twenty years. He was the 2013 season one winner of The American Baking Competition on CBS. He currently resides in Itasca, Illinois, with his wife and daughters, where he’s a principal at Our Marketing Works, LLC. Bake Off is his first cookbook.